Settlements finally come to life with this transformative mod. 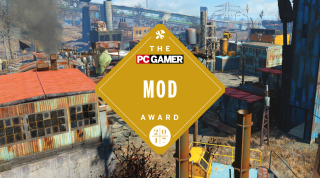 This year's best mod is Fallout 4's Sim Settlements. Below, our writers share their thoughts on why it made such a meaningful difference to the game. To see the rest of our 2017 GOTY Awards, head here. Chris Livingston: Sim Settlements is sort of astounding to me. It gives Fallout 4 players an entirely new way to build settlements by, essentially, allowing NPCs to build their own. Designate zones for residential, commercial, or industrial buildings, and then sit back and watch your settlers erect their own buildings, randomly pulling from pools of assets so each building is a unique. As your settlement grows the NPCs will add on to their buildings, adding more props and features and even second stories. Each time you visit a settlement, you'll be able to see their progress, which gives your settlements a feeling of real life, and gives your settlers some agency. They aren't just standing around waiting for you to place every last door, bed, or stick of furniture. The really great thing is, you can still use the vanilla settlement system at the same time, even inside the same settlement. Zone some areas for NPCs to develop, build some areas yourself. You can decide how hands-on you want to be. It's an amazingly thoughtful and well-made mod that could easily be incorporated into the game itself. Sim Settlements helps make Fallout 4's settlement system feel more connected to the rest of the game. Joe Donnelly: Fallout 4's settlement system confused me at launch. With so many other things to get on with in The Commonwealth, who could be arsed piecing together makeshift HQs with rickety bed frames, recycled cinder blocks and filthy old toilet bowls? Not me, which is why I paid the Sim Settlements mod little mind when I first caught wind of it. Seriously, if I’m to be dropped into a brutal post apocalyptic world with a shed load of firearms and melee weapons at my disposal, I want to take the scores of weird, hostile and irradiated beasts knocking around to task—not playing interior designer. I get that rebuilding the world is a big part of survival, but I'd rather leave all that to someone else. Enter Sim Settlements. To quote the mod's ModDB description: "It also feels bizarre that you have to micromanage all these people, and personally plant seeds and decide where people sleep—you're their leader, not their mother! You're supplying these people with security and tons of resources, why can't they kick in and help out with building up the city?" To this end, my otherwise useless Sanctuary Hills-dwelling comrades were suddenly crafting buildings by their own volition in some sort of nuclear war-ravaged edition of 60 Minute Makeover. The tedium was removed from base building and it was great. And the joy of returning from several hours of roving the Wasteland to find one of my settlers' projects completed, as they toiled and moiled on their next venture was second to none. I mean, who'd have guessed Preston Garvey had such a creative streak? In doing so, Sim Settlements helps make Fallout 4's settlement system feel more connected to the rest of the game. Moreover, an adjustable needs system allows the basic needs of your settlers to change over time, meaning maintaining base happiness is more challenging and raid less predictable. Phil Savage: It's such a great idea for a mod that the main game feels bereft without it. Fallout 4 is a game about communities, and Sim Settlements lets those communities work towards their own recovery. Read Chris's impressions of Sim Settlements here.